Stepping In to Help: I Am Concerned About My Child's Physical Development - What Should I Do? Ziva Schapiro, OTR Take the Early Childhood Physical Development Checklist. From the time of a baby's birth, we eagerly wait for the day when our child will start to roll over, crawl and then walk. Unlike speech and language development, these milestones are at first glance easily determined. Either a child rolls over or he doesn't. Either he crawls or he walks. Brittany's mother wants her to do well in school. She purchased a special series of workbooks designed to help develop cognitive skills in children. Every day when she gets home from work, she sits with Brittany to work on her skills. But despite her mother's best efforts, Brittany usually ends up on the floor screaming and yelling. All she wants to do is go outside, play on the swings and run around the yard. Introduction - Is My Child Normal? When the name for this series was first proposed, it made me feel uncomfortable. After all, calling a child "normal" or "abnormal" is certainly incorrect. Each child is an individual, with unique qualities and personality. Yet, as I continued working on this series, I realized that this question goes straight to the heart of what we, as parents are concerned about when we consider our children's development. For parents, the area of speech and language development is probably the hardest to evaluate. When evaluating physical development, the process is easier. This series was written in consultation with Rachel Bromberg, MACCSLP - Speech and Language Therapist * TAKE THE EARLY CHILDHOOD LANGUAGE DEVELOPMENT CHECKLIST .The results of the checklist should give you some indication of how your child is doing compared to other children his age. The Speech and Language Therapist Recommends Therapy For My Child, But I'm Not Sure If I Want To Have Any Sort Of Therapy At Such a Young Age. Maybe It's Best to Wait and See If His Skills Improve on Their Own and, If Not, To Start Speech and Language Therapy When He Is Older? NO. What Activities Can I Do with My Child to Encourage Her Language Development? The activities below are great learning approaches and activities for all children and are especially important for children who are having language difficulties. AGES 0-3 1. Speak to your child in "SIMPLE" sentences. Two of the oldest and most respected institutions devoted to understanding children -- Bank Street College of Education in New York City and Parents Magazine -- teamed up long ago to bring to the public a classic called "What to Expect of a Young Child." Written by Irma Simonton Black for Parents in 1941, the article was reissued three times in pamphlet form by Bank Street. Although the black and white photos and the language bespeak a former era, the information is as relevant and important today as it was six decades ago. In Part I of this article, we introduced Irma Simonton Black's ideas about what to expect from children from infancy to three years. Black wrote a classic article called "What to Expect of a Young Child," which appeared in Parents in 1941. She contends, and anyone would agree, that in order to have healthy, fulfilling relationships with our children, we need to know what they are capable of at what ages. Too many conflicts and misunderstandings erupt because parents expect a two-year-old to share when she cannot or a three-year-old to hurry when he is not yet capable of doing so. Do you feel that in today's world, children are being pushed to develop quickly and not enough time is spent on enjoying the moment and allowing children to progress at their own pace? 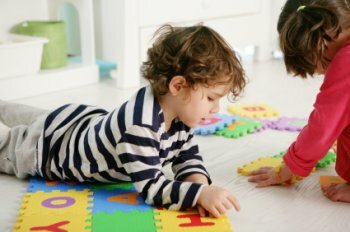 Are you sometimes concerned that modern toys, including television and computers, may hurt rather than help your children's development? If so, the philosophy and approach to early childhood developed by Rudolf Steiner may work well for you and your baby. Six-month-old Jeremy is lying on the living room rug, looking intently at a board book, when his Uncle Luis breezes in through the front door. "Hiya, fella!" he says, lifting his nephew high in the air. Jeremy frowns in protest. Putting the baby down, Luis turns to Jeremy's mom, Lucia Chan. "What's wrong? Did he get up on the wrong side of the crib?" "No...I think you just interrupted him," says Lucia. "Huh?" This from Luis. Both adults look down at Jeremy, who has gone back to his book and seems utterly content. Imagine a place where babies don't cry and children never fight. Jean Liedloff found such a place. She spent a total of two-and-a-half years living with the Yequana Indians in the Venezuelan jungles. She describes them as an isolated Stone Age tribe, yet, on every measure of well being that she could think of, Liedloff found the Yequana to be better off than Westerners. After babyhood, Yequana parents and other adults don't initiate contact or activity with their children but are readily available when the children need them.